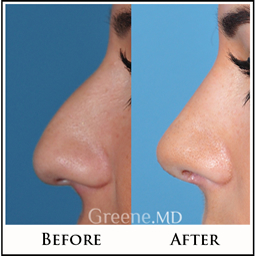 At this time, Dr. Greene is currently not accepting new patients for rhinoplasty. Rhinoplasty, sometimes referred to as a ‘nose job,’ involves making precise structural changes to the nose to create a more desirable shape and contour. Rhinoplasty has remained a very popular plastic surgery procedure, due to its ability to make dramatic changes in one’s facial appearance. This can have a very positive impact on one’s self-esteem as well. Rhinoplasty is considered by most surgeons to be the most complex of all plastic surgeries of the face, and careful selection of a Rhinoplasty surgeon is essential. To obtain consistently good results, the surgeon must be skilled in all types of noses and be proficient in advanced techniques. Without the appropriate training and experience, obtaining these results becomes more of a random process. 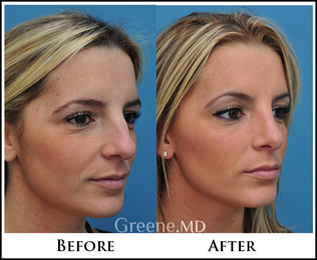 Dr. Greene developed a passion for rhinoplasty while in medical school, and sought to obtain some of the most intensive training in the world. 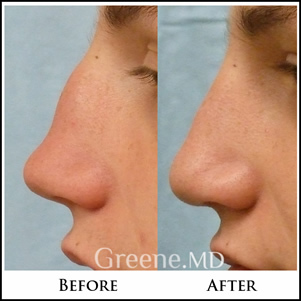 Dr. Greene’s training and extensive experience ultimately led to his unique approach to rhinoplasty. 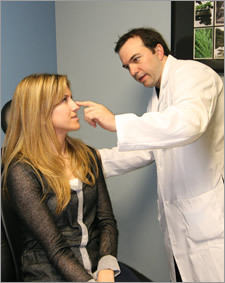 His knowledge of nasal surgery and passion for rhinoplasty is evident when each patient meets him in consultation. Because of his experience, Dr. Greene is often sought after by patients who have had surgery elsewhere and desire a revision surgery. Finally, his background in head and neck surgery also taught him to appreciate the functional aspects of nasal surgery, and he aims to maintain, or even improve, nasal breathing after cosmetic or functional rhinoplasty. I believe that rhinoplasty is the most challenging procedure performed in facial plastic and reconstructive surgery. However, it is also perhaps the most rewarding for both patient and surgeon. Throughout my early career, I sought training from some of the most well-respected rhinoplasty surgeons in the world. I made it my goal to master this complex operation and follow in the footsteps of the rhinoplasty pioneers who trained me. Great things can be achieved with a well-executed rhinoplasty. The nose is a central focal point on the face, and is one of the most noticeable facial features. It has been said that a good rhinoplasty can be seen in the eyes; in other words, the nose should not draw attention to itself. This idea is one of the major reasons that a patient seeks rhinoplasty – they desire less attention to their nose, not more. For any given patient, there are many ways to perform a rhinoplasty. In fact, it is rare to find any two surgeons agree on the best surgical plan. That being said, I do not believe that a rhinoplasty outcome is solely dependent on the technique or maneuvers selected. As long as the surgeon formulates a careful plan that stabilizes while reshaping the nose, a more predictable result can be attained. Many patients ask me if I use the ‘open’ (external) or ‘closed’ (endonasal) approach. Depending on the situation, I will select either approach. In many cases, both approaches can be equally effective. Many surgeons favor one approach over the other; I believe that both are valuable. The choice of approach is complex, and one that I discuss with every patient that is seen in consultation. It is important for the patient to understand that there is no such thing as a ‘perfect’ rhinoplasty result. However, patients are generally very pleased with their results. Be very skeptical of any surgeon that promises perfection. While in careful and skilled hands there is an excellent chance of success, rhinoplasty is one surgery in which there is an element of unpredictability. This is why the postoperative period is so critical, a time when the patient must adhere carefully to a strict regimen. It is vitally important to be completely comfortable with your surgeon. Rhinoplasty and its healing process often require multiple visits. I emphasize to patients that I will always be there to address their concerns. I also require at least two preoperative visits before a decision is made to proceed with surgery. This gives the patient a second opportunity to ask any remaining questions and further understand what to expect. It also gives me an opportunity to clear up any misconceptions that the patient has about rhinoplasty. A word of warning: be mindful that there is a lot of misleading information about rhinoplasty on the internet. Unfortunately, more confusion has been created than questions answered. Rhinoplasty is an elegant operation that continues to challenge even the most proficient surgeon. With a well-formulated plan, precise surgical technique, and adherence to a strict post-operative regimen, outcomes are optimized and patients receive the results that they desire. Rhinoplasty is a surgical procedure that involves reshaping of the nose. This is accomplished through modifications of the overlying soft tissues or underlying skeletal framework, or both. It is considered by many to be the most complex of all plastic surgeries of the face. First of all, individuals who undergo rhinoplasty must be in good health. The best candidates want to improve the appearance of their nose and also have realistic expectations about what can be accomplished with surgery. Who type of anesthesia is used in rhinoplasty? General anesthesia is usually preferred, but sometimes local anesthesia combined with sedation is chosen. How long does the surgery take to perform? The time it takes to perform rhinoplasty varies. Simpler cases may be completed in under an hour, while more complicated procedures may takes over three hours to complete. What is the difference between open and closed rhinoplasty? There are two types of rhinoplasty procedures, based on the approach selected. The two approaches are external and endonasal, and are based on where the incisions are made. Various factors are involved in the selection of the appropriate approach. Dr. Greene will evaluate the needs of each patient and will decide which approach is most appropriate. Where are the incisions made for rhinoplasty? In the endonasal (closed) approach, incisions are made on the inside of the nose. The external (open) approach has incisions inside the nose, but also has an additional incision on the underside of the nose, between the nostrils. Will I have visible scars after rhinoplasty? All incisions produce scars. In the endonasal approach, there are no visible scars. The external approach involves an incision on the underside of the nose. The scar that results is usually well concealed and not very noticeable. What is recovery like after rhinoplasty? After rhinoplasty, there is always some swelling, and sometimes some mild bruising around the eyes. In order to minimize swelling, it is best to elevate your head for at least 24 hours and avoid any exertion. Although you will still feel a bit drowsy during the next day, most patients report feeling much better after two to three days. Will I experience much pain following rhinoplasty? Most people report mild discomfort, but rarely pain. You may feel like you have a congested nose. Typically there is no need for nasal packing, but occasionally a light pack is placed in the nose. If so, it is removed on the morning after surgery. Do I need to take time off of work to recover from rhinoplasty? Yes, you are required to take some time off of work in order to heal properly. However, you are usually able to return to work within a week following surgery. When can I exercise after rhinoplasty? Light exercise may be resumed in about a week. More strenuous exercise should be avoided for up to one month, as this can cause swelling. Can anything be done if I don’t like the results of my surgery? Rhinoplasty is a surgery that requires patience, because it takes many months for the nose to heal properly. The nose will continue to refine throughout the first year after surgery. For this reason, revision surgery is best avoided during this time. However, in certain cases, very minor revision work may be undertaken; this is usually best avoided, if possible. Does insurance cover any of the cost of rhinoplasty? It depends. Rhinoplasty is sometimes performed for both cosmetic and functional reasons. In some cases, insurance may cover some of the cost if surgery is being done to treat breathing problems or deformities.